An industry leading grass seed manufacturer had a need to change their process to fulfill a growing worldwide demand for a specialty grass dust used to enhance the grass growing process. This company has a solid sixty year reputation for superior quality and service. 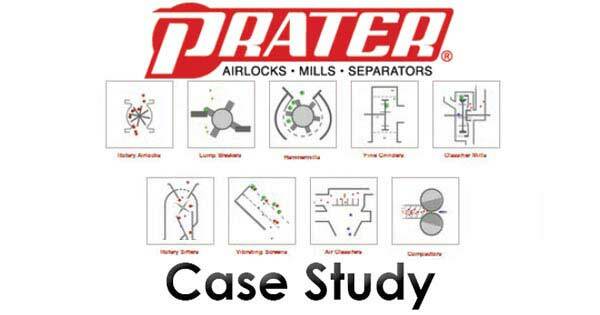 They reached out to Prater to improve their process and consistently provide a superior product to it’s end users. After having quality control issues with their existing Toll Processor, the grass seed manufacturer approached Prater for a solution. The toll processing company had been grinding a very exact blend including Urea and Bone Meal to create a patented grass dust for the grass manufacturer and its end users. The toll processor had been utilizing a competitor’s Air Classifier Mill (ACM) but had been achieving results outside of the seed company’s specified particle distribution. Time constraints were an additional challenge for the manufacturer. The end of the grass growing season was approaching quickly and the timeline for finding a solution and implementation was very tight. Fergus Keane, National Sales Manager for Prater invited the client to our Bolingbrook, Illinois testing facility to familiarize them with the Prater equipment capable of achieving their required results. They wished to use the visit to observe a test as well as to evaluate the feasibility of purchasing their own equipment, allowing them better quality control oversight and control of the process. A production level test of the blended Urea and Bone Meal was run on a Prater Classifier Mill, comparable to the toll processor’s ACM equipment used at their former tolling facility. Based on the initial test results, Prater also suggested running the test material on a single pass Fine Grinder to see if this grinding technology could outperform the toll processors ACM. The grass seed manufacturer witnessed both tests. After being pleasantly surprised by the tight particle distribution the M-51 Single Pass Fine Grinder could achieve, Fergus invited the manufacturer to visit another customer’s production facility to see Prater’s fine grinding technology in action. After which, the grass seed manufacturer felt certain the Prater equipment would be the proper fit for their application. Fergus promptly provided the customer with a proposal for a Bulk Bag Unloading System, a Feeding & Blending System for the specific formulation of Urea and Bone Meal, an M-51 Fine Grinder capable of achieving a superior quality grind, and a Sterling Control System to automate their process. The proposal was immediately approved and the order was placed. Technical system drawings were provided to the client for approval and the system was built to the customer’s specifications. All materials were delivered to the client for installation. The successful system start up was facilitated by Prater and the entire project was completed within 5 months of the initial contact. The grass seed manufacturer is both elated by the top-rate quality of the grass dust produced, but they were also extremely appreciate of the cost and space saving measures proposed by the Prater Team. The system is still currently operating flawlessly in the grass manufacturer’s Oregon facility. Fergus Keane is the National Sales Manager for Prater. As part of his role, he also maintains a direct sales territory working with customers directly to provide them with world class processing solutions. Fergus has an extensive background in providing Process Solutions for over 17 years. Fergus has worked in his current position at Prater since 2010. At Prater, results come first. Prater has been providing reliable particle management solutions since 1925. The company specializes in an extensive line of equipment and engineered systems including lump breakers, hammermills, fine grinders and classifier mills, screeners/separators, air classifiers, compactors, minor/micro ingredient batching systems, and plant-wide automation/controls.